You may have been blindsided when you first lost your job, but losing unemployment before you've found a replacement job can also be a sucker-punch. As difficult as it all is, you still have to will yourself into being proactive. 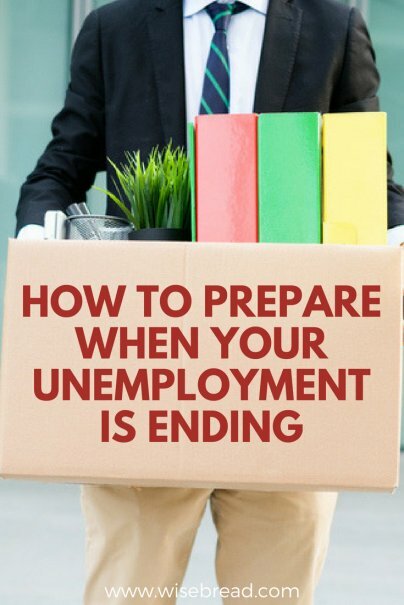 Here are a few things you should do to prepare for the end of unemployment compensation. Reduce your spending and live off as little as possible. And do your best not to depend on the benefit. The benefit itself makes this easier because it usually isn't enough to cover all of your living expenses. It is only assistance — similar to someone helping you up when you trip and fall. They help you to your feet. They don't carry you. Job loss is so devastating because it is a loss — economically and emotionally. Dealing with the hurt, betrayal, and disappointment is a massive task by itself. Add to that coping with money issues and the instability it causes, and you've got a deep hole to climb out of. This can make looking for another job seem like a herculean effort. Try and view your unemployment compensation as a safety net and springboard. It helps ease the financial burden and it should propel you to action. Federal and state-funded assistance programs are available specifically to help you through this period. Sadly, these programs' processes can be slow, bureaucratic, and inefficient, which is why it is imperative that you start the process ASAP. Benefits and programs vary by location, so be sure to check with your state's local agencies to understand requirements and procedures. Formerly known as the Food Stamp Program, SNAP provides food purchasing assistance to families in need. The amount you receive is based on your household size, income, and expenses. If you qualify, this could be a great way of ensuring your family is fed. It can also free up some cash enabling you to repurpose the grocery money and use it for another need. The benefit can be used at a host of traditional grocery stores, convenience stores, and even at your local farmers market. Have you ever heard the saying, "If you can't find a job, create one?" That's exactly what SEAP is designed to help you do. SEAP is a state-funded grant program specifically designed to train individuals receiving unemployment the basics of launching their own small business. And the best part about this program is that in most states, participants are not required to look for a job. The training program is your employment seeking activity. To find out if you qualify, check with your local unemployment office. If you foresee yourself struggling to pay rent or your mortgage, help is available. The Department of Housing and Urban Development (HUD) offers a number of rental assistance programs including the Housing Choice Voucher Program. This voucher program provides assistance by paying all or a portion of your rent, if you qualify. Most states also have some sort of Emergency Rental Assistance Program which provides short-term, income-based assistance. And the federal government offers assistance to those in rural areas through its Rural Rental Assistance Program. If you are struggling to make mortgage payments, the Federal Trade Commission offers protection for distressed homeowners from predatory and unscrupulous lending practices. There are a lot of private and nonprofit agencies that can help you refinance, negotiate a short sale, and/or keep your home if you fall behind. The key is to do your research. Understand what you are signing. And don't make decisions out of fear or under pressure. You have options. Breathe, consult an objective expert, and move forward with what works best for your situation. Every state has a different suite of services and resource offerings for those in need. Finding those resources can be difficult — especially when you don't know where to look. 211.org was established to address this need. It is a repository of information containing resource offerings for every state and parts of Canada. It is a free service that can help you find federal, state, local, nonprofit, and (small) fee-for-service assistance. It doesn't matter if you get help from family and friends, your church, or a federal or state source, as long as you get help.